Did you know that your cat's stomach is only the size of a ping-pong ball? Or that wild cats spend a whopping 80 percent of their waking hours hunting for food? 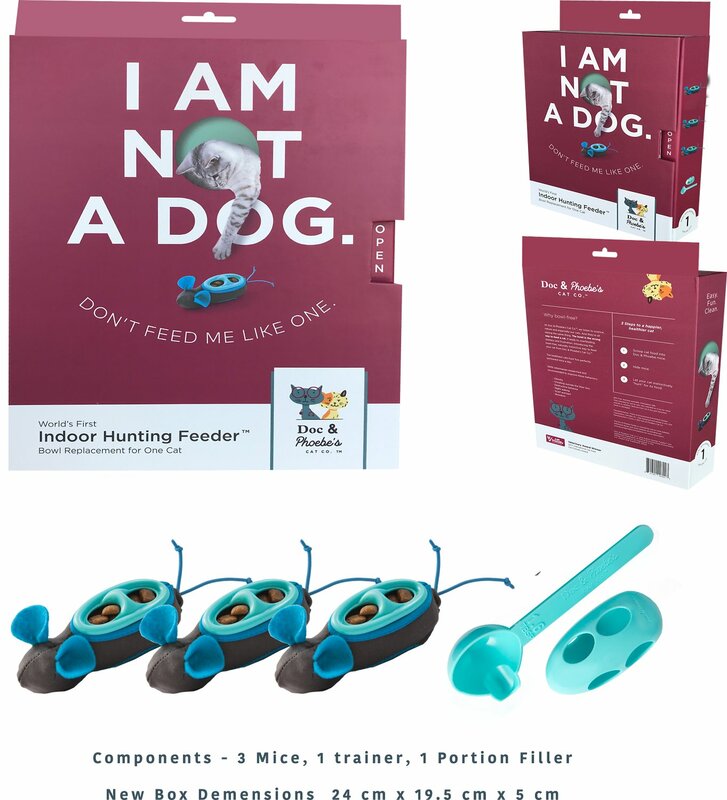 Now you can channel your cat's inner panther and feed in small portions with the Indoor Hunting cat feeder kit from Doc & Phoebe's Cat Co. With this unique feeding system, your kitty can satisfy her instincts without leaving your home, and without leaving a real mouse in your lap. Simply fill the feeders with your cat's favorite food, hide them throughout the house, and let your cat fulfill her wildest dreams. 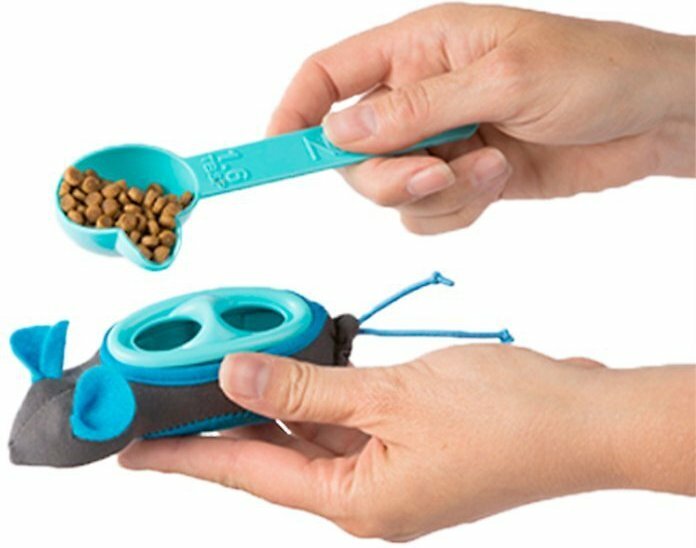 It's a complete bowl-replacement system for one cat, designed for three, small meals twice a day. And, with more feeders, multi-cat homes can enjoy the benefit of hunting, too! Fulfilling the hunting instinct may decrease your cat's anxiety, discourage "scarf and barf," and even deter night-waking! After all, cat parents love their furbabies, but no one loves that 3 AM wakeup call when the kitty's stomach rumbles. This kit allows your cat to be more independent while satisfying her ancestral hunting instincts. And a happier cat means a happier human. 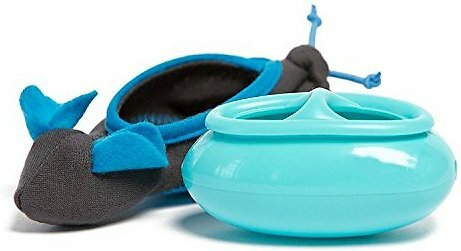 Veterinarian-designed system works to improve scarf and barf, night waking, litter box "hit and miss" and more by allowing your cat to act on her ancestral desires. 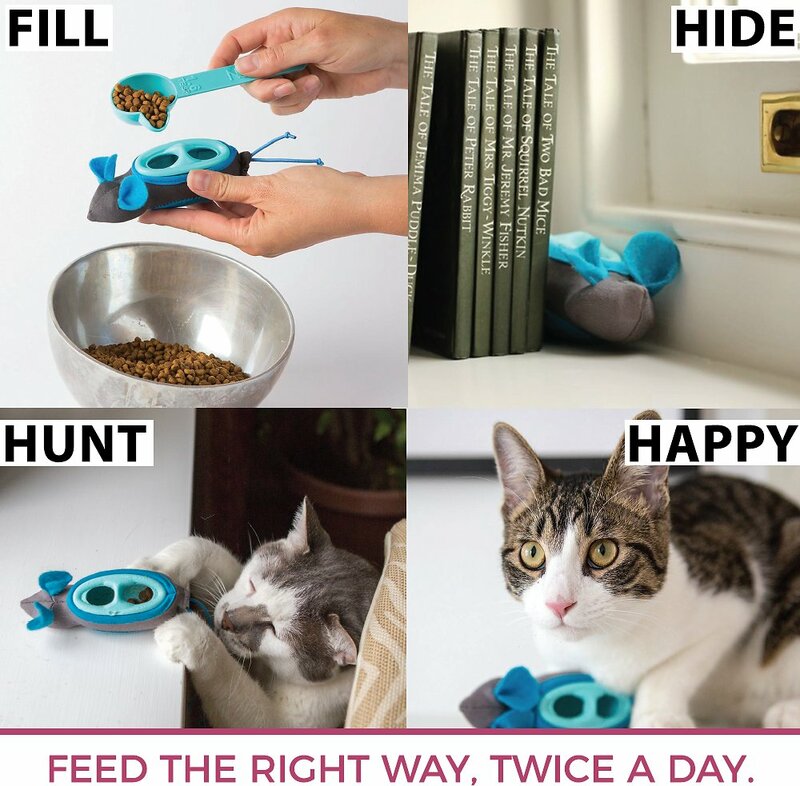 3 interactive feeders allow cats to hunt for small portions of food twice a day, instead of relying on you to fill a large bowl once-a-day. 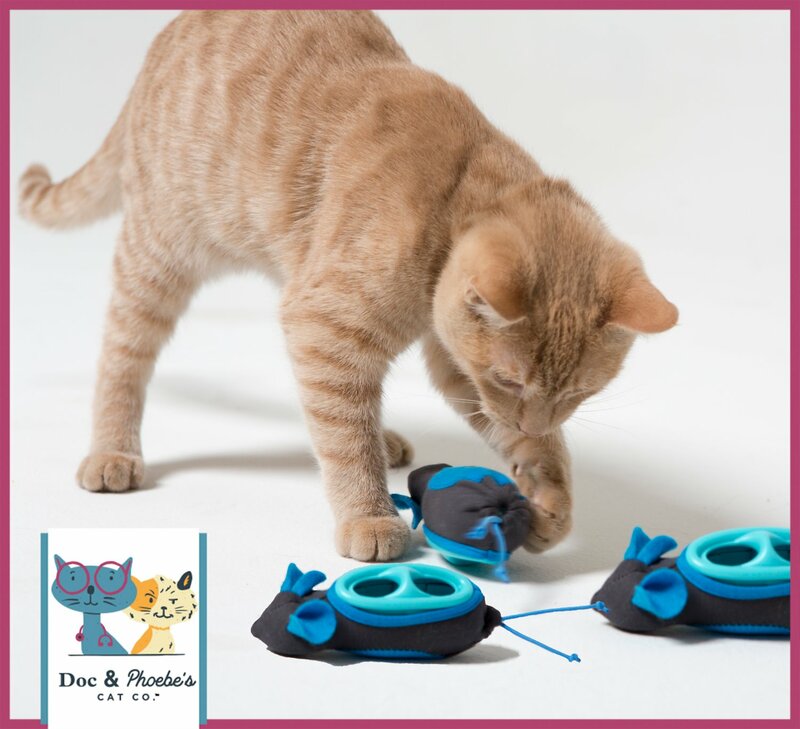 Durable plastic and textured fabric appeals to cat’s senses while she grabs and claws her prey. 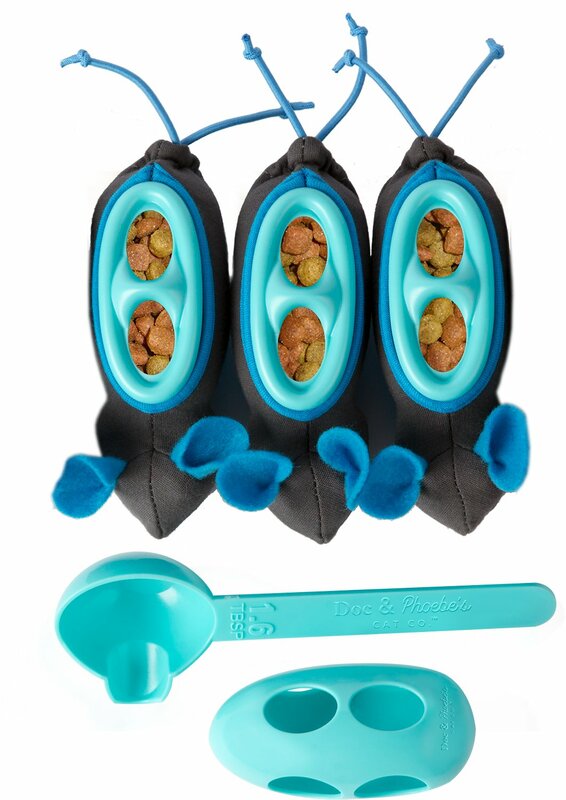 Easy to use—just scoop your cat’s favorite food into the 3 mice and hide morning and evening. BPA-free plastic is top-rack dishwasher safe plastic while the fabric skins are machine washable. (1) Trainer with multiple dispensing holes, (3) Feeders with two dispensing holes, (3) Feeder Skins, (1) Scoop. Intended only for use by cats. Not intended as a toy for other animals or children. Remove from cat if any part becomes loose or damaged. Make treat time even more exciting by placing scrumptious Vital Essentials Mini Nibs in the Doc & Phoebe’s Cat Co. Indoor Hunting Cat Feeder! 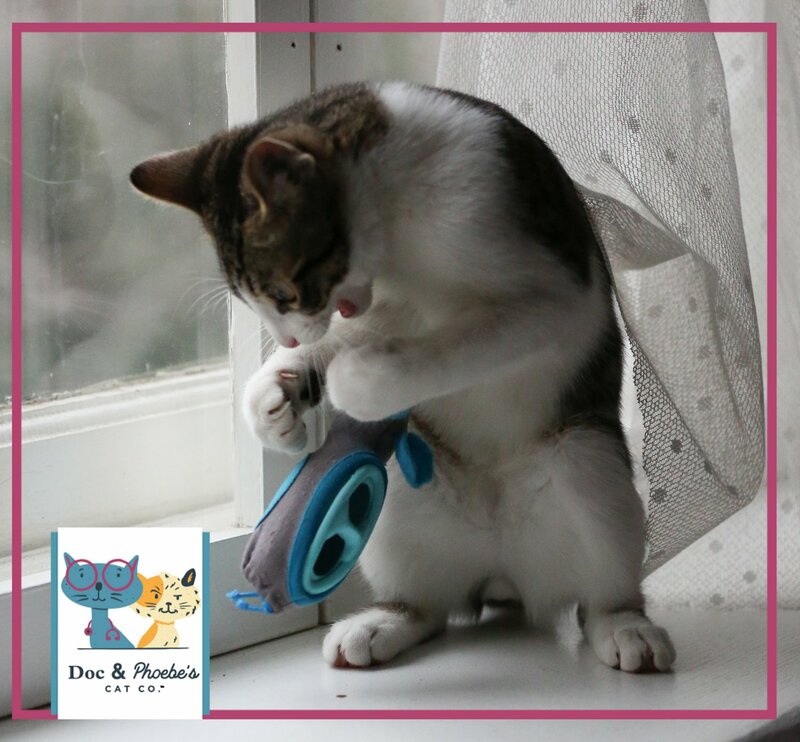 See all items by Doc & Phoebe's Cat Co.
To use, simply fill three feeders with dry food or treats you are already feeding your cat, and hide them twice a day (morning and evening). Your cat will hunt the feeders, play with them, and eat the small portions of food just as nature intended. The Trainer, Feeders and Scoop are made with BPA-free plastic and are dishwasher safe on the top rack. Machine wash and tumble dry the Feeder Skins. To feed the average 10 lb cat, add one Feeder Scoop full of dry food to each of the 5 Feeders. The average 10 lb cat eating only dry food, requires approximately ½ cup of dry food per day. The portion filler is designed to be ⅕ of this amount. Doc & Phoebe's Feeders are portion controlled. Feeding your cat an appropriate amount of food in small portions throughout the day will help your cat to maintain a healthy weight. Doc & Phoebe cats hunt to find their food. The hunt is the exercise in disguise. Cats that have a healthy body weight live longer lives. This is what's been missing from my life! I didn’t think they would work but they do! I have a very energetic 1.5 year old indoor kitten and was looking for a new way to being more engagement and stimulation to her life (and perhaps distract her from opening all of the cabinets and drawers). These are great! We used the 'trainer' mouse for her evening meal for about 5 days before moving to the real mice and she caught on very quickly. It's amazing how quickly she will find them now after nearly 2 weeks! And she seems to love it too- she purrs when she finds one. She is also no longer yeowling while looking at her food bowl for an hour before meals. This did not work to put our cats food in. They literally just stared at me and then proceeded to scream at me for food. I think they’re just a little on the lazy side. I tried it with 5/7 of our cats. They do like them when I hide them throughout the house with treats in them though so that’s a plus. Warning though, dogs like them, so don’t leave them where they can find them. Let me start with a disclaimer -- it's not fair to ding a product when you don't follow directions, so read this review with a big grain of salt! I absolutely love the idea of these feeders, and based on the reviews I read before purchasing, some cats love them and others couldn't care less. My kitty couldn't care less, but I only tried once -- he didn't seem to care that there was food inside, he completely ignored the "trainer". I admit that I did not follow the instructions (eek!) by removing his food bowl at night -- just couldn't bring myself to do it. But I fully intend to try again, maybe when I have a little more time to focus on doing what I'm supposed to. I really loved this concept of hunting for some food, but be warned that kitty may or may not be interested. We tried this product since he was waking us up at 5 am to eat. We hoped putting these out at night would stop the early morning wakings, but it really didn't. Plus, he would knock it around and get kibbles around. Not too messy but not really great to have to clean up after in various locations. We just leave some kibble in his bowl now and the wakings have calmed down. My cat took to these immediately and gets excited for meal times. My 3.5 lb Yorkie loves them too, as she scavanges for left over cat kibble. I don’t always have time to inspect the entire house floor for Brian’s leftovers which make the dog, Wilson, sick. Mouse feeders are used only when the cat and dog have separation for several hours at a time (while I’m at work).